Scotland is an Incredible, Wild, Historic, Mystical Country that Just Begs to be Visited. 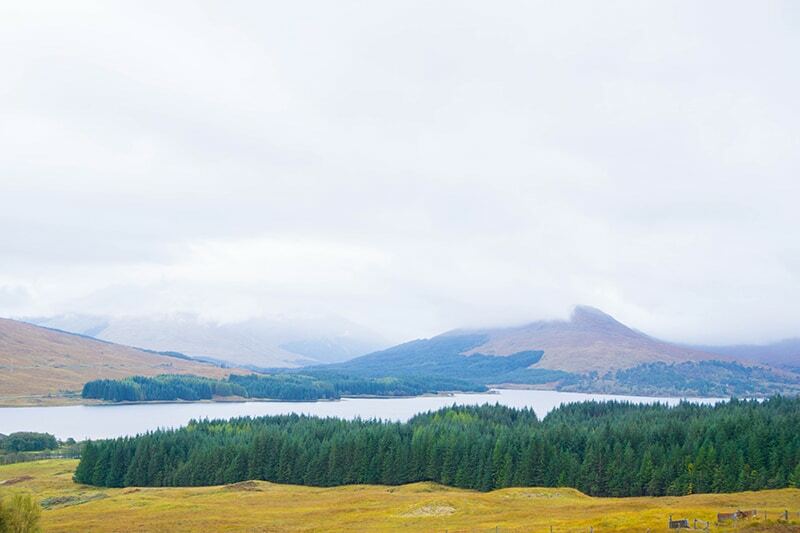 If Scotland is Calling you, I’ve got the Perfect Scotland Itinerary for You. So you’ve been bitten by the “Scotland Bug” and you’re ready to plan your trip! Great choice! Scotland is an incredible country with a deep, rich history and culture. 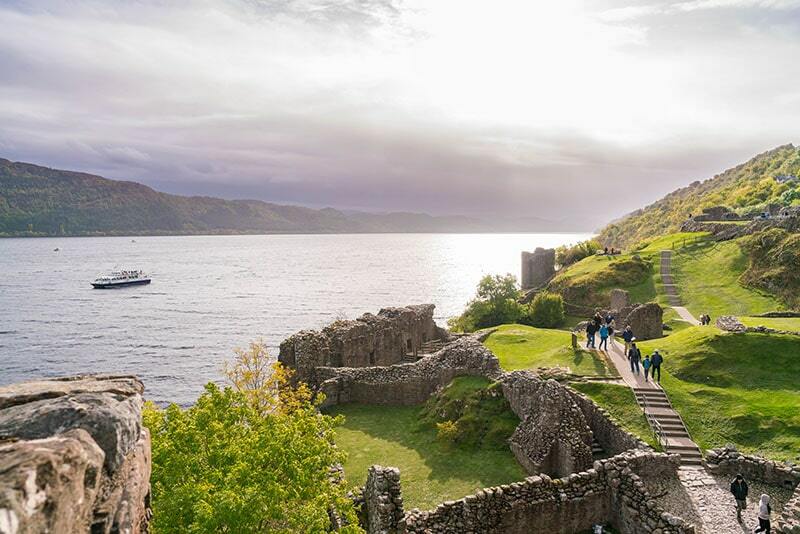 You’ll be able to see hundreds of historic sites, abbeys, castles, sheep, highland cows, and even more stunning scenery. Although a relatively small country, there is so much to see and do, that it can seem overwhelming. But fear not, I have broken down this Scotland itinerary into seven days of pure Scottish awesomeness! 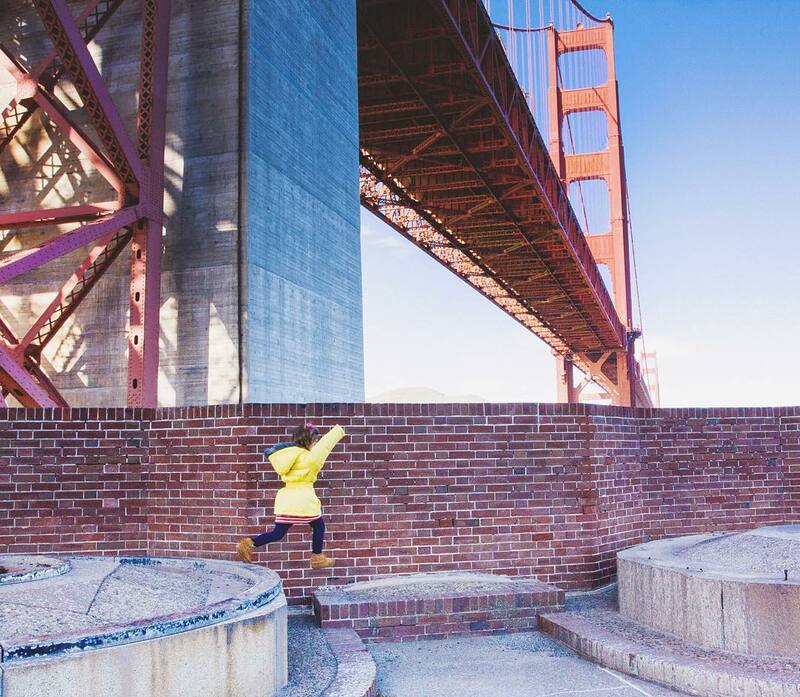 Half the fun of visiting somewhere new is planning what you’ll see, do, eat and wear. 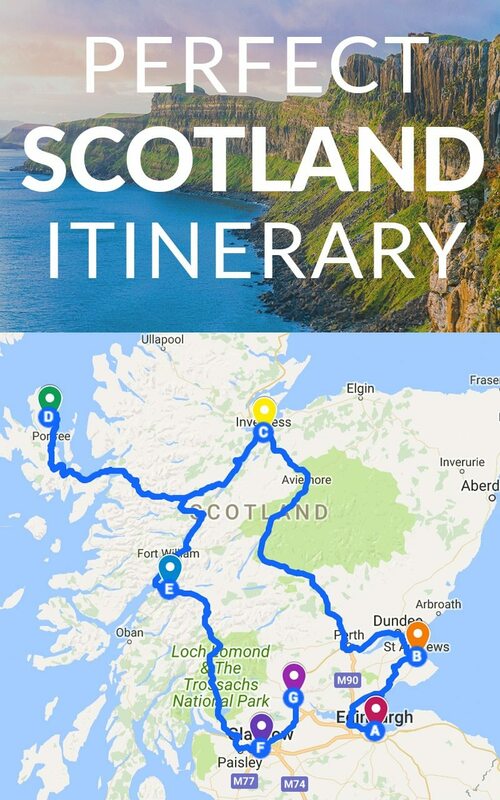 Be sure to read through this itinerary and it’s accompanying posts on the Isle of Skye, Edinburgh, Inverness and Glasgow to give you an idea of what you want to see and where your priorities are and what you want to include or exclude from your personal Scotland itinerary. Follow this Scotland Packing List to be sure you have the best gear! Scotland is a gorgeous country…love it to death, but can we talk about the weather? You’re not going to Hawaii ok, so plan accordingly! The weather in Scotland can be…unpredictable! I would pay no mind to any weather forecast you have previously looked at. The skies can change on a dime and surprise you for good or bad. Chances are, no matter what time of year you go that you will have rain and it will be chilly during some part of your trip. 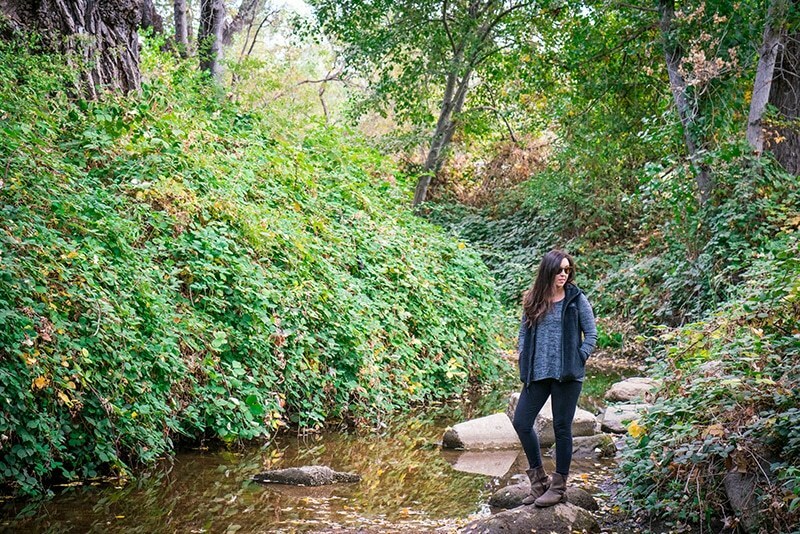 Having layers and waterproof gear is essential. 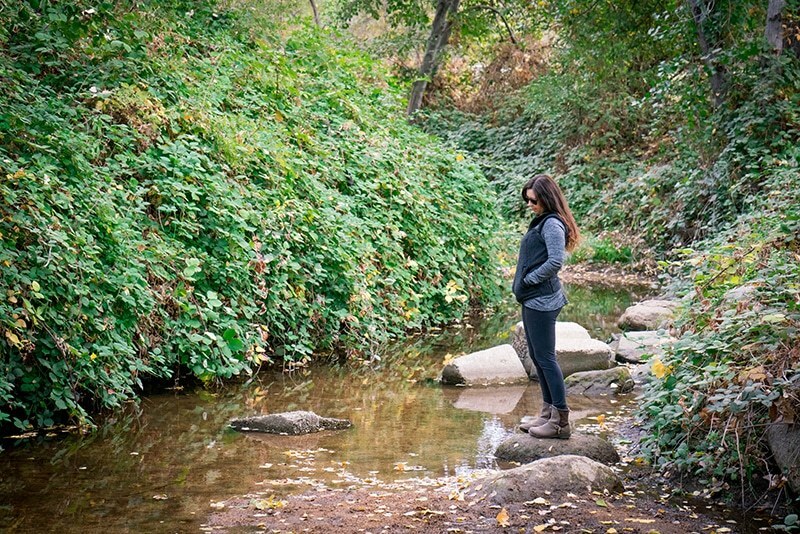 I love The North Face Campshire Fleece line from Zappos for layering. It’s seriously the warmest and most comfortable thing I own! I love having a vest because it provides so much extra warmth on top of just having a jacket. 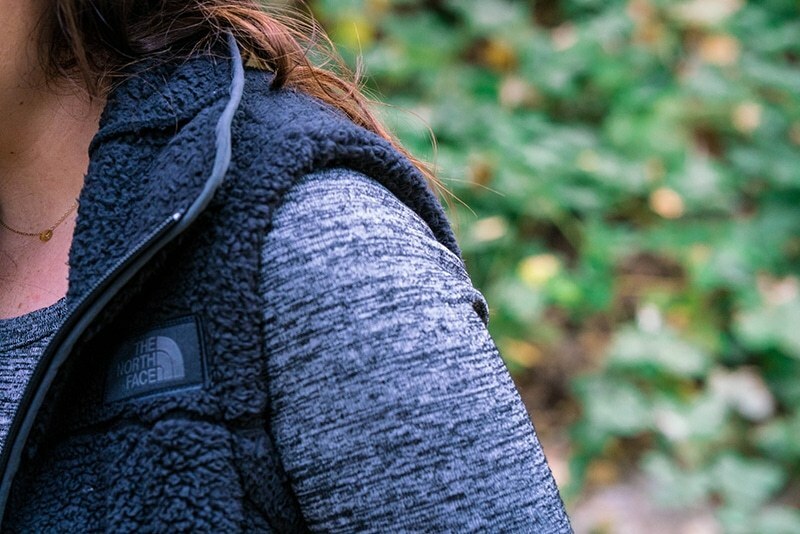 The North Face also have great waterproof, fleece lined gear, so you’re getting the best of both worlds by being warm on the inside and dry on the outside. Abbi loves this jacket because she gets hot easily so if she needs to she can wear a sweater underneath in colder weather, but only wear this jacket if she’s getting too hot and still stay dry. 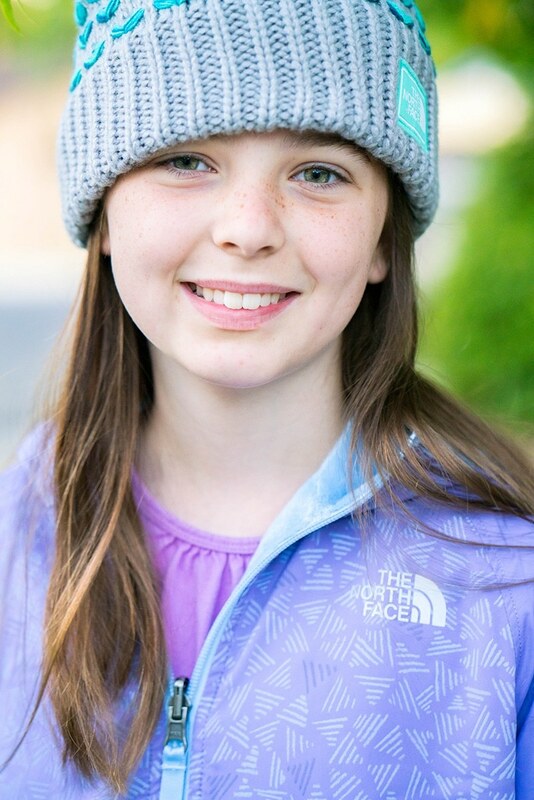 I’m also digging The North Face fleece lined hats from Zappos that don’t itch (the biggest hat complaint from my kids)! Waterproof shoes and warm socks are also a must! Try to stay organized when planning your Scotland Itinerary. I love using Google Maps, or Phone Apps like TripIt or Roadtrippers to plan out my itinerary and driving route before I leave. This is especially helpful if you won’t have cell service or have bad service, which is entirely likely in Scotland, especially as you get to the highlands. 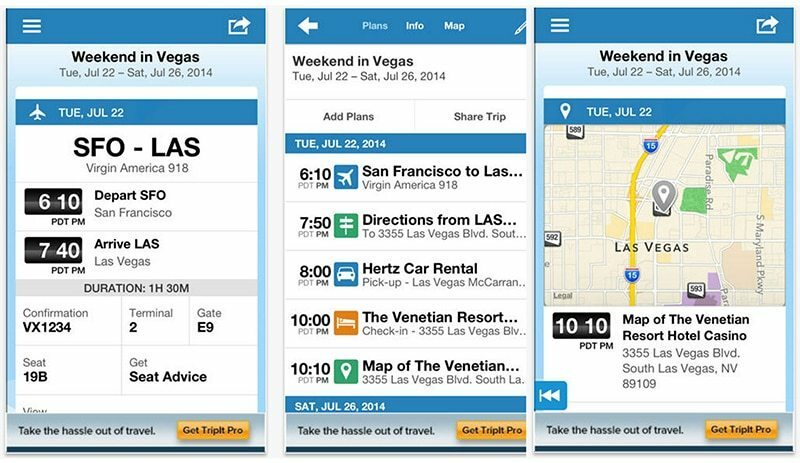 It’s great to have an offline option for keeping your trip organized. 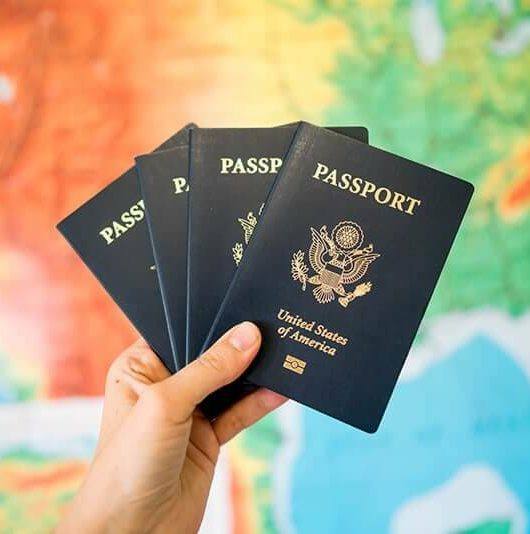 It helps to keep all your flight itineraries, rental car confirmation numbers, driving directions and hotel addresses all in one place and looking tidy. It’s great if you have to go back and log expenses as well! 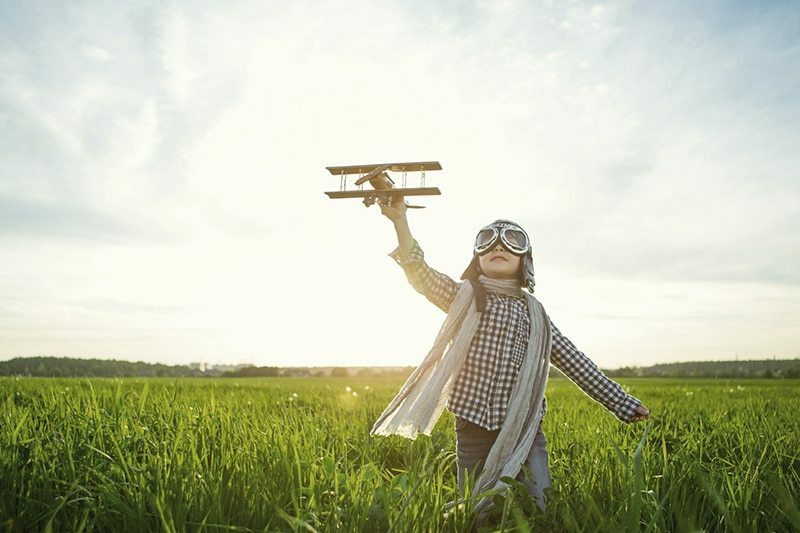 The cheapest flights into Scotland can usually be found to Edinburgh or Glasgow, but be sure to check other, smaller airports such as Aberdeen, where some budget airlines might fly into. Find out how I get insanely cheap flights to Europe ALL the time! Consider adding Scotland onto the beginning or end of a trip to Europe you already have planned. Getting around Europe by plane can be shockingly cheap! For my last trip to Scotland, I was already going to be in Ireland for 2 weeks, so decided to add on Scotland to the end of my journey. I spent a whopping $40 on round trip flights with this airline! 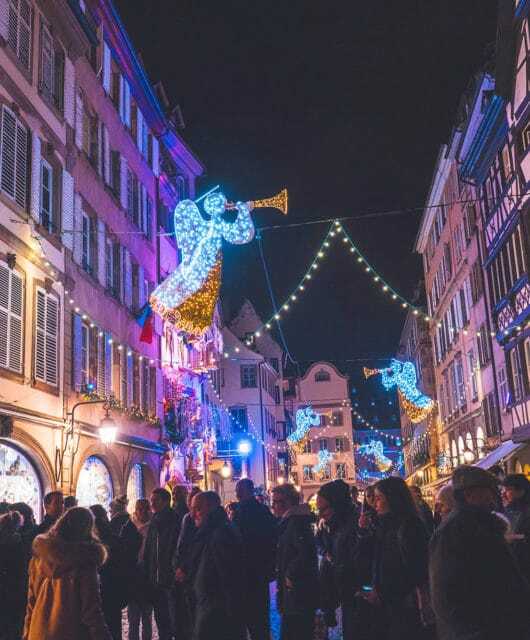 If you can’t find cheap flights from your home country to Scotland, be sure to check flights to surrounding cities that may be cheaper to fly to, such as Dublin, London, Paris, or Frankfurt. Then look at buying a cheap flight from a budget airline such as Ryanair to get you to Scotland. I found a cheap flight from Boston to Ireland for $60 during Norwegian’s killer sale and a flight from Dublin to Edinburgh for $40 round trip. 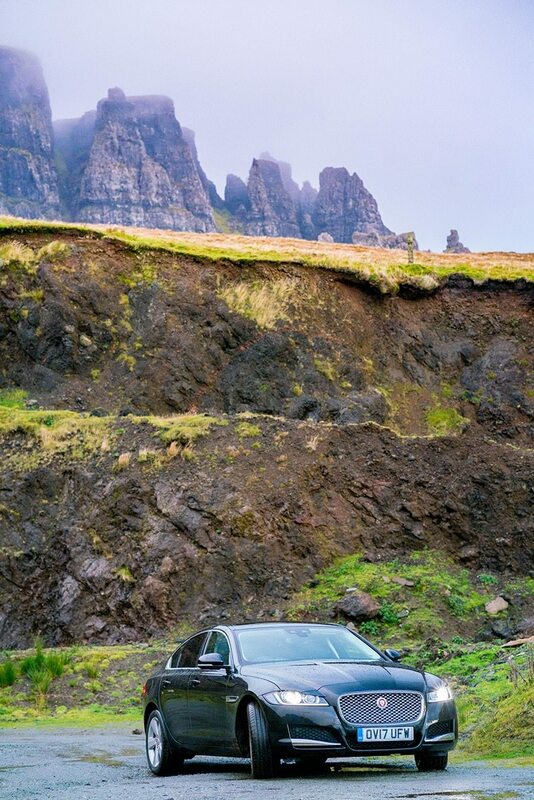 Driving on the Isle of Skye in a Jaguar…the only car the rental company had left…I recommend getting something smaller! Repeat the word “left” in your mind or out loud several times before you drive and while you’re starting out. Close your eyes and visualize yourself on the left. These seem kind of silly, but they will really help as you prepare to completely flip your usual driving autopilot brain backwards! When in doubt, follow the car in front of you. Roundabouts: Scotland and Europe, in general, is full of roundabouts. They are fantastic things that really help with the flow of traffic. In Scotland, they will curve to the left. Most of the time they consist of several lanes. be sure to follow the arrows or signs for which lane you need to be in. There can be anywhere from 2-6 or more exits on a roundabout and they can get pretty tricky. Just pay attention and you will be fine. Narrow Roads: Scotland is full of narrow roads with stone walls on either side. It’s an effort, but be sure to stay in your lane and not grazing the side of the wall or hedges. One Track Roads: You may come across quite a few one track roads, especially on the Isle of Skye. This means that there will be one lane shared by two directions of traffic. You will see “passing places” along all the roads where you must pull over and wait for cars to pass if you see them. Always pull over to the left. Never cross the road to pull into a passing place located on the right. Watch for animals: There’s nothing more magical than being in a sheep traffic jam! Just be sure to give them the right of way and pay attention. Also, look out for deer! Insurance: With all of the narrow roads, stone walls, hedges, small parking spaces and new left driving orientation, I always recommend that you get the full insurance on a rental car.Alternatively, look into your credit card as some cards, such as Chase Sapphire offer full rental car insurance in foreign countries. Be sure to bring along proof of this for the rental car company. 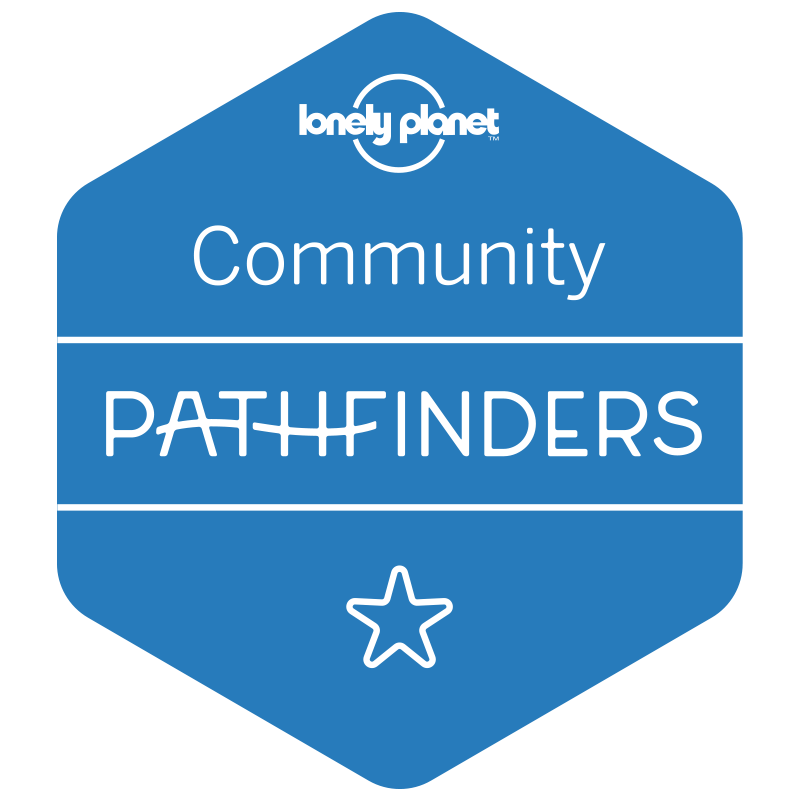 Now that you’ve done all you can to prepare for getting to, driving in and packing for Scotland, it’s time to talk about where you’ll be heading! 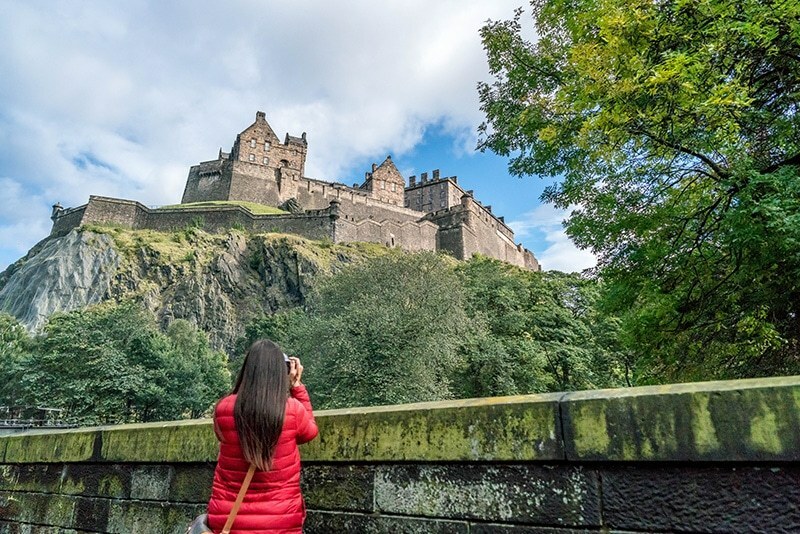 I’ve arranged this trip to begin and end in Edinburgh, where most flights will take you to in Scotland, but you can start this itinerary from anywhere on the map, or skip, add, change direction and alter to your heart’s content! I’ve created this interactive map of your 7 day itinerary with directions between cities included. Edinburgh will most likely be your starting point on your journey around Scotland, if it’s not, feel free to skip ahead! 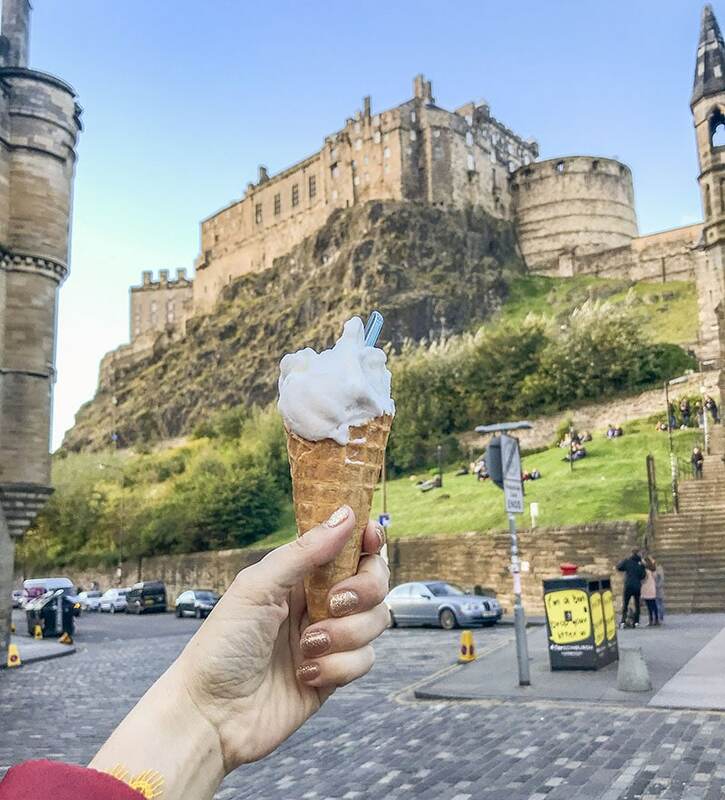 Edinburgh is a beautiful city full of rich history, vibrant culture, and delicious food! What I think I love most about Edinburgh is that old world feel mixed with a quirky vibe that’s hard to describe. There are some amazing Airbnb apartments right in the historic center of Edinburgh. When we stayed there we booked a very affordable place which had a patio overlooking Edinburgh Castle. It was incredible and a highlight of our trip! My kids said they loved being able to look at “Hogwarts” haha! You can find that apartment here. Here is a list of affordable apartments in Edinburgh for families of 4-6! You could spend weeks wandering the streets of Edinburgh, but I’ve given you two days here, so get busy! Now that you’ve finished up seeing Edinburgh, head to St. Andrews, known as a golf mecca and home to St. Andrews University which was founded in 1413, making it the 3rd oldest university in the UK, following only Oxford and Cambridge. St. Andrew’s Cathedral: Once the largest church in Scotland, St. Andrews Cathedral was a place of pilgrimage for Catholics during the medieval ages. It is in ruins now, but you can climb St. Rules tower and take in the views from the top. St. Andrews Links: Even if you’re not a golf enthusiast (I certainly am not), take a stroll along the cart paths and appreciate the famed course for its beauty and views. Blair Castle: This beautiful castle was just featured on an episode of Victoria and it’s right off the motorway, so stop if you have the time! Known as the capital of the highlands, Inverness is an ancient city with a long history. 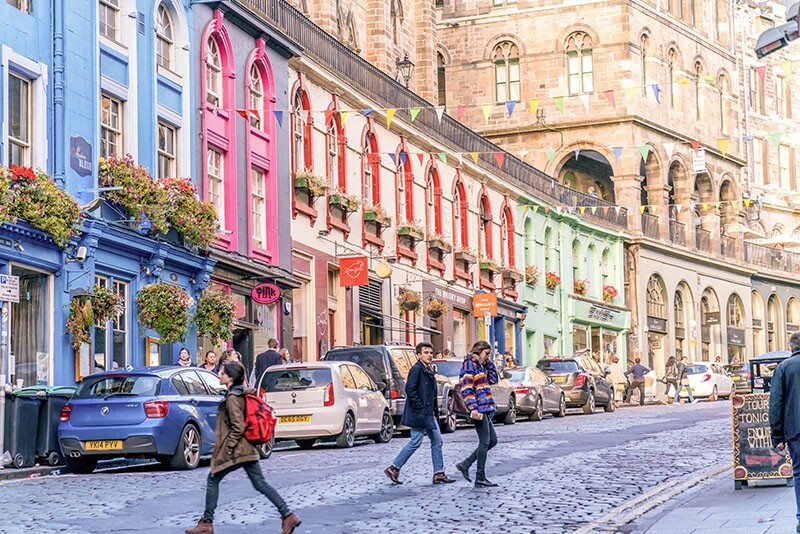 Home to Shakespeare’s infamous Macbeth and the stage for the Jacobite uprising and final defeat, Inverness will allow you to connect with the past like nowhere else. I recommend stopping here for at least one night and giving yourself a full day to explore the surrounding areas. 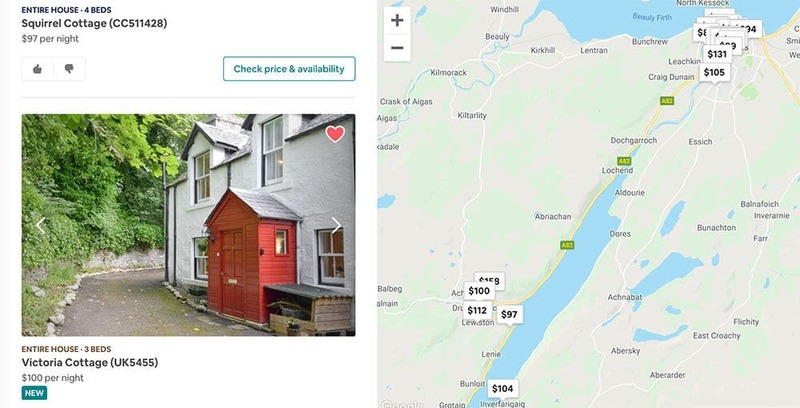 There are plenty of Airbnbs in the area, or you can even rent a camper van to hunt for Nessie yourself! Take your time getting to Skye, but try to arrive before dark as you’ll be driving on one track roads at times, which can be tricky come nightfall, and riving over the Skye Bridge is something you’ll want to do in the daylight. I recommend staying in Portree for the night as it is the capital of Skye and has great food and accommodations. This will be a great location for everything you’ll be doing tomorrow. 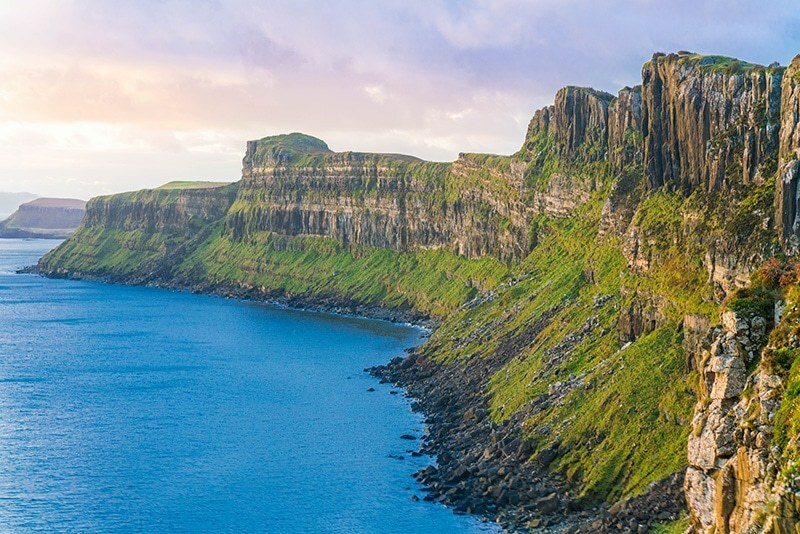 The Isle of Skye, while becoming increasingly popular, is truly worth the drive! You’ll feel as if you’ve stepped back in time once crossing the bridge onto the island. While the island is small, there is much to see. I recommend staying here for at least two nights to give yourself a full day and maybe even two half days here. There are some fantastic Airbnbs on the Isle of Skye. Most of the homes are old shepherd cottages that are just adorable. We stayed in an old shepherd cottage near the Museum of Highland Life that had the most incredible sea view! I honestly didn’t want to leave. You can find our Airbnb here. 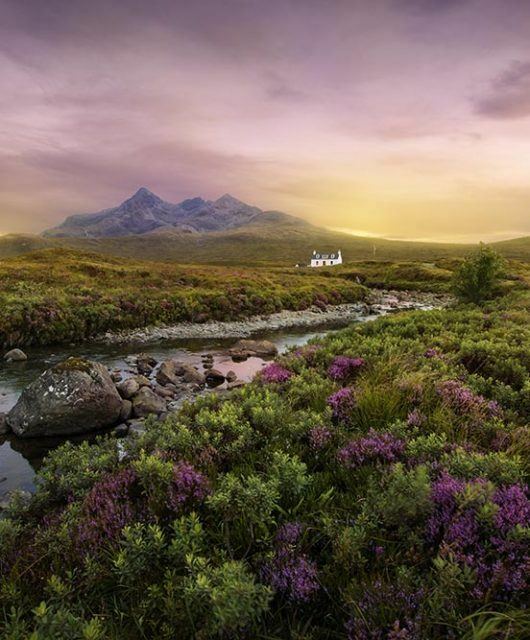 You’ll probably want to spend another night on the Isle of Skye, since you’ll have a really full day and you don’t want to drive out of here at night! 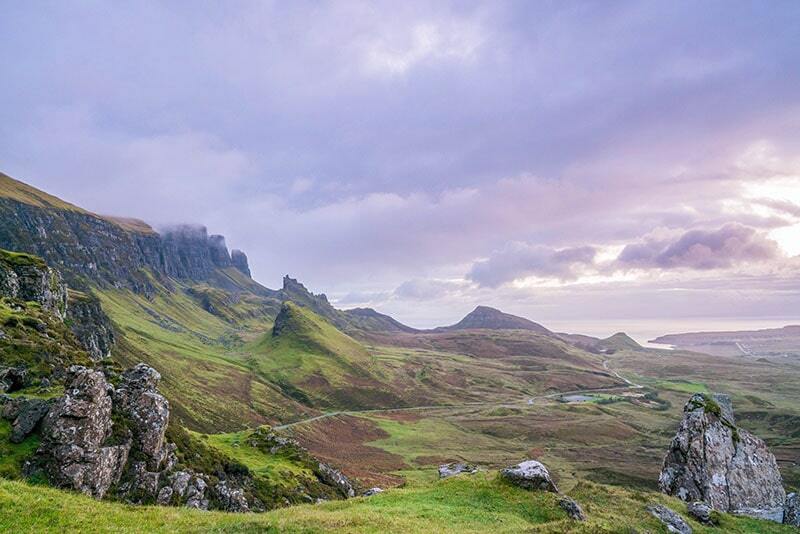 Wake up and finish anything on the Isle of Skye that you missed yesterday and start your journey to Glasgow. 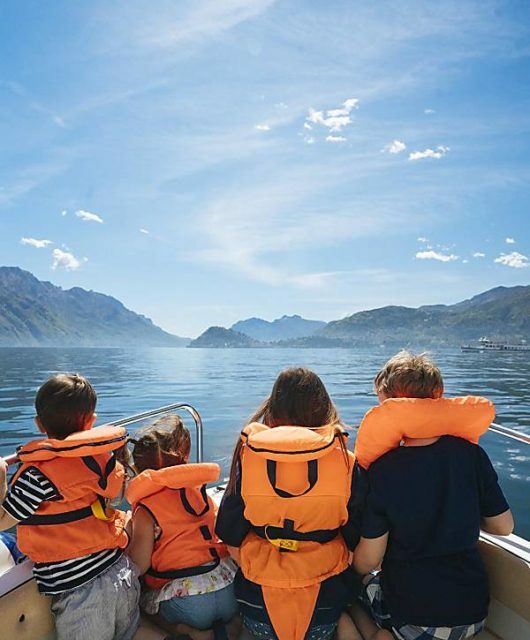 On your way there, stop at Glencoe and take in the beautiful scenery. Spend half the day exploring Glawgow. 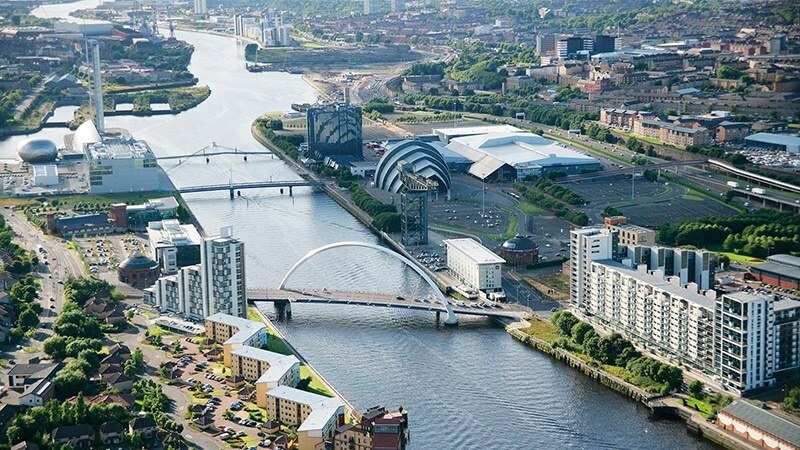 Follow this Glasgow Local’s Guide. Then head to Stirling Castle and back to Edinburgh! 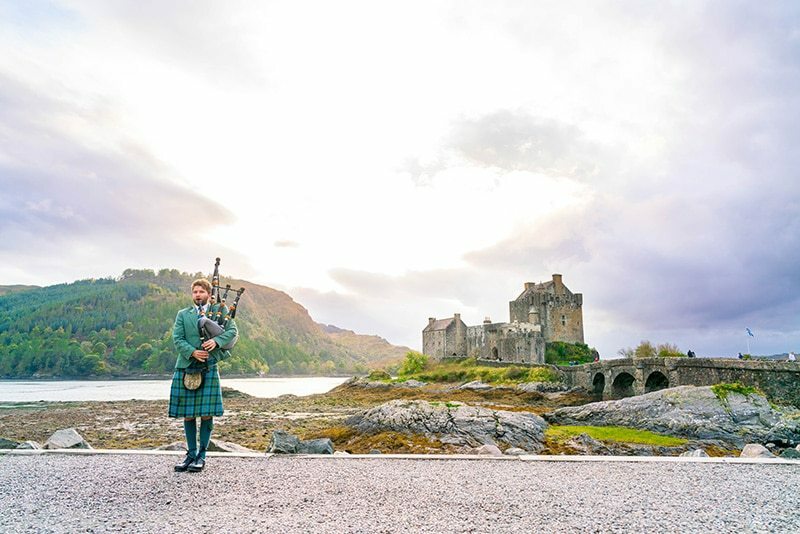 I hope you fall in love with Scotland as much as I have and I hope this perfect Scotland itinerary will help you plan the perfect trip! I’m always happy to help with trip planning. Connect with me on Facebook or Instagram if you need help! And check out The North Face on Zappos to get your Campshire gear ready for your trip of a lifetime to Scotland! I am truly loving the theme/design of your website. Do you ever come across any internet browser compatibility situations? A lot of the site visitors have complained concerning my garageband free site not operating correctly in Explorer though seems fantastic in Opera. Do you have any kind of suggestions to assist repair this matter? Hey, you are certainly correct. I frequently look over your content closely. I am likewise fascinated with wifi router settings, you might discuss this from time to time. I’ll be back. Hello there, what do you think around wireless gaming headset? Very interesting subject, huh? Hello! I recently came across this website and I honestly enjoy it. I always like to focus on router setup at times. Great to be here, bless you! right after establishing it generally within the U.S. and U.K.
and video however, individuals need a plug-in installment). There’s awesome developments on the layout of the webpage, I really like this. My site is relating to upvc sliding sash windows and certainly, there are plenty of things to be done, I’m still a starter in website development. Take care! Somebody essentially help to make seriously posts I would state. This is the first time I frequented your website page and thus far? I surprised with the research you made to make this particular publish incredible. Wonderful job! Any accommodations you would recommend in Scotland? We are looking at a week in the summer and have just started looking. If we spend a few nights in Edinburgh, St. Andrews, Isle Of Skye, and Inverness, did you book Airbnb’s in each place? When we went to Edinburgh again, the hotel was booked so we stayed in this Airbnb which was also awesome https://www.airbnb.com/rooms/23706638 a lot smaller though!